Survival Training | News and Features | Style Weekly - Richmond, VA local news, arts, and events. Forget the gym. The military-style workouts of SEAL Team Physical Training continue to win converts across the city. 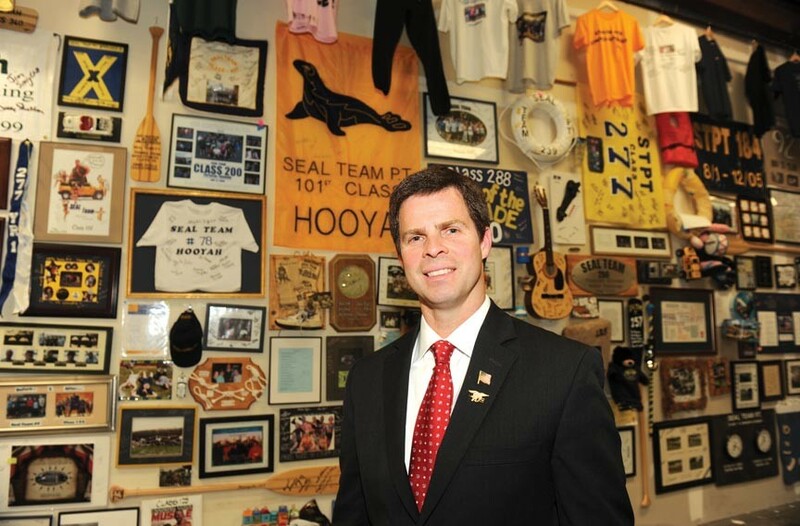 John McGuire, owner of SEAL Team Physical Training, in front of his tribute wall in the company’s offices on Dabney Road. Like its namesake in the armed forces, SEAL Team Physical Training seems virtually unstoppable. In the next couple of months, the physical fitness company will expand its classes to the West End and open a branch in Philadelphia. Started nearly 14 years ago by John McGuire, a 10-year Navy SEAL veteran, the company eschews the traditional one-on-one workouts with physical trainers for large-scale, intense group exercises with classes that start as early as 5:30 a.m.
SEAL Team has worked with the WNBA's Washington Mystics, the Virginia Commonwealth University men's basketball team and is in training discussions with an NBA team. Last month the company made local headlines after VCU Coach Shaka Smart completed SEAL Team's two-week basic fitness class. "He was leading by example, encouraging his teammates and pushing as hard as he could every day," McGuire says of Smart. It was just the latest in a string of headline-grabbing news for the company, which has been featured in Sports Illustrated, The Washington Post and, coming soon, a big-time men's health magazine. The calisthenics workouts are loosely based on McGuire's military training, and take place in public parks. McGuire doesn't need the expensive machines or floor space of a gym to give a good workout — though he likes to incorporate rafts and kayaks to keep things interesting. "If you make it exciting, people are going to come back, and they're going to bring their friends," McGuire says. A typical workout with SEAL Team might include pushups, kayaking, running, bear crawls, back extensions and lunges. No two routines are identical, which McGuire says helps keep clients engaged. "Every day is something different, with a different focus." Jim Thornton, president-elect of the National Athletic Trainers' Association, says that group exercise and incidental exercise, such as taking the stairs instead of the elevator, seem to be growing in popularity. "I think people are looking at ways to break out of the gym," Thornton says. "People are tired of the treadmill, and you're seeing more of these group-type activities." But group exercise is nothing new, and actually used to be the norm, according to William Sands, director of education at the National Strength and Conditioning Association. "If you look at exercise around the early 1900s, there were tons of group exercises that people brought over from Europe," Sands says. The shift came in the 1920s when many jobs switched from agricultural to industrial. "It sounds like people are getting back into calisthenics-type workouts," he says. McGuire launched his company after retiring from the military, while he sought to settle into a job that allowed him to spend more time with his family. To supplement his income in those early days, McGuire worked odd jobs, including shoveling snow sometimes into the early morning. "Friends and family were telling me there's no way that men and women are going to work out together," McGuire says. "I had a lot of naysayers, but I believed it was a good idea." Within a year McGuire was able to focus solely on his business of 20 to 30 clients. The client list now numbers near 1,000, and his staff includes five office employees and 30 full- and part-time instructors. In Richmond more than 350 classes have graduated from the program, and McGuire has added corporate team-building classes and athletic team training. In the past couple of years, McGuire has opened outlets in Charlottesville and Washington. This month SEAL Team will start conducting workouts at Innsbrook and Deep Run Park in Henrico. The Philadelphia location will open in July. McGuire was planning to expand to other cities earlier, when he experienced what he refers to as "a minor setback" in 2006. While attempting a back flip off a trampoline, McGuire broke his neck, instantly paralyzing him. His doctor told him that he wouldn't make it through the night, and if he did, he would never have the use of his arms or legs. He'd broken his C-4 vertebrae, and couldn't breathe without assistance from machines. "Can you imagine that?" McGuire says. "I've jumped out of helicopters before they crashed, had a bullet land beside me — and it's a trampoline." Determined to get back on his feet, McGuire did physical therapy exercises in his hospital room into the night. He recalls one exercise where he had to pick up checkers and place them into a box. The first time he attempted the exercise, he realized a puddle had formed beneath him. It was his sweat. Within a year, McGuire could walk somewhat normally. It's this can-do attitude that clients find inspiring, including local actor Scott Wichmann. He joined SEAL Team Physical Training in 2008 and fell in love. Wichmann had previously contemplated joining the Navy, and after spending time with McGuire and his brother, Rusty, was inspired to enlist as a Navy reservist. "John is a master motivator who challenges you day in and day out to go farther, faster and try harder," Wichmann writes via email from Afghanistan, where he's serving. "His life is a living testament to that ethos." As for McGuire, he seems to be gaining some notoriety independent of his physical-training program. He served as an on-camera expert for CNN after SEALs killed Osama bin Laden. He's returned a handful of times to discuss the SEALs, gives lectures as a motivational speaker and has been approached by three publishers to write a book.